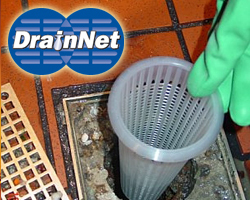 Drain-Net has developed a highly popular waste interceptor product line we call GDRU’s. However, this commercial kitchen necessity can be called many things. We call it a GDRU (Garbage Disposal Replacement Unit) because it can replace mechanical garbage disposals which have been outlawed in a number of states. Instead of grinding the food waste and wasting precious freshwater for flushing, the strainer-drawer in GDRU strains solid particles under the pre-rinse sink when dirty dishes are being pre-rinsed, affecting a much needed pretreatment process of restaurant wastewater. A GDRU can also be called an “Indirect Waste Interceptor”. Many states such as New York and New Jersey have passed laws that require restaurants to install indirect waste units. A typical plumbing code states, “Indirect waste connections shall be provided for drains, overflows, or relief vents from the water supply system, and no piping or equipment carrying wastes or producing wastes or other discharges under pressure shall be directly connected to any part of the drainage system.” Our versatile GDRU’s can easily be installed to meet this requirement. An air gap can be created before the inlet or after the outlet to meet the indirect connection requirement. Grease Traps and Grease Interceptors primary function is to separate grease from wastewater. However, debris filled water can quickly accumulate in a grease trap, rendering it ineffective. A GDRU should be installed before waste water reaches a grease trap. Commercial kitchens who install Garbage Disposal Replacement Units see a dramatic improvement in grease trap functionality and can reduce grease trap service visits. Believe it or not a GDRU can go by even more names such as an “Indirect Waste Separator,” “Food Waste Separator,” “Flat Strainer,” “Indirect liquid waste separator,” or a “Wet Waste Interceptor. Whatever you call the product, you can be sure that your restaurant or commercial kitchen will stay compliant with local plumbing codes and that your drains stay free of food waste.